By Patrick McHugh: David Haye says he saw the injured IBO/WBA/WBO heavyweight champion Tyson Fury dancing around on his injured leg, and he says it can’t be that bad. Fury recently reported that he suffered an ankle injury while training. 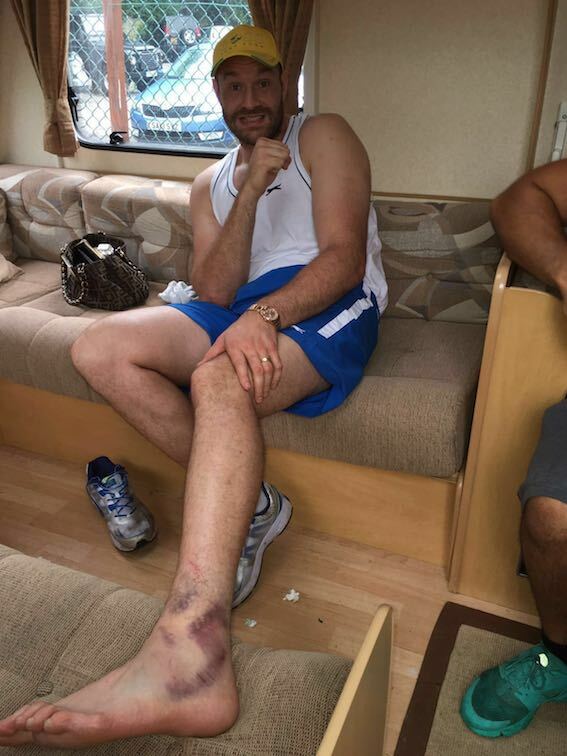 Fury then supplied pictures of his discovered ankle as proof of his injury. The injury has resulted in Fury’s scheduled July9 fight against Wladimir Klitschko to be postponed until a still to be determined date. In the past, Haye was twice scheduled to fight Fury and both occasions, he had to pull out of the fight with injuries. Haye suffered a cut while training for their September 2013 fight, which led to it being postponed until February 2014. However, Haye suffered a bad shoulder injury in November of 2013 that caused him to cancel the fight with Fury. Needless to say, Fury wasn’t too happy about it, and eve since then, he’s said that he doesn’t want any part of scheduling fights with Haye. Fury will likely reschedule Wladimir fight for the end of October unless he suffers a setback with his injured ankle. Haye is looking forward to seeing the Fury-Klitschko rematch. Haye was beaten by Wladimir five years ago by a 12 round unanimous decision defeat in 2011. Haye did little on offense in the match. He spent much of the bout moving on the outside and trying not to get hit by Wladimir’s right hands and left hooks. Wladimir played it safe as well by choosing to throw very punches. He did just enough to win every round and no more. Wladimir could have gone for the knockout, but he looked like he didn’t want to take any risks. Haye was out of the sport for three and a half years with injuries. He recently launched a comeback last January, and he’s now picked up two quick wins over Mark De Mori and Arnold Gjergjaj. Haye has taken a lot of heat from the boxing fans for facing weak opposition, but he’s not bothered by it. Haye says he’s not going to step it up against better opposition before he gets a title shot against IBF heavyweight champion Anthony Joshua. Haye is expected to face 44-year-old former WBO heavyweight champion Shannon Briggs in his next fight in September.